When using kosher salt (versus table salt) for cooking, should I adjust the amounts called for in recipes? It's easy enough to adjust to taste in savory dishes, but what about for baking, where precision matters? Is sea salt like a kosher salt to be used in cooking, or a finishing salt? And what about so-called finishing salts? According to Thomas Keller, no slouch in the kitchen, mastering the use of salt is “the single most important skill in cooking.” It goes into just about everything we cook, and it's been called “the only rock we eat.” Although salt has a bad reputation from its abuse in processed foods, we shouldn't fear it. Salt is so important that it's at the root of the food words sauce, sausage, and salami, and even non-food words like salary and salacious. So, Susu, your quest to understand salts is a worthy one. The good news is that all culinary salts are nearly chemically identical, so you don't need to fret about using the right or wrong salt for a particular job. I don't remember seeing my mom use it, but kosher salt has become popular in recent years. Alton Brown features it on his television show, and it is the go-to salt in professional kitchens due in part to its purity of taste (some table salts contain iodine, and most contain anti-caking additives). It should really be called koshering salt, because it is used in the processing of kosher meats. Regular table salt is kosher, too — at least, the box I have from Safeway says so. I like kosher salt because it's easier than table salt to pinch between your fingers; its texture is great for pasting garlic and clinging to fried potatoes; and, let's face it, it's cool to use what the chefs and TV stars use. Diamond Crystal kosher salt seems to be the preferred brand in professional kitchens. If you want to avoid additives, look for Diamond Crystal and its single ingredient, “salt.” Morton's kosher salt includes “yellow prussiate of soda” (which I guess sounds more palatable than '“sodium) as an anti-caking agent, but I can't taste any difference between Morton and DC. I wouldn't be able to sleep at night if I didn't inform you that Morton does not recommend using its kosher salt in baking recipes (except as a topping on, say, pretzels). I called their consumer-affairs line to ask why, and they said it's because kosher salt takes longer to dissolve than table salt. I'm not sure that's true. [/books/collections/allbooks/On+Food+and+Cooking "Harold McGee" newpage=true] says that table salt takes “the longest” to dissolve, and I've used both Morton and Diamond Crystal in many baking recipes and never had a salt-related problem. So I'll continue to bake recklessly, but don't say you weren't warned. Assuming the recipe you want to make uses volume measures (such as teaspoons and tablespoons) rather than weights, then yes, you'll probably need to adjust the volume when using kosher salt in place of table salt. If recipes included weights as well as volumes, figuring out salt equivalencies would be much easier. 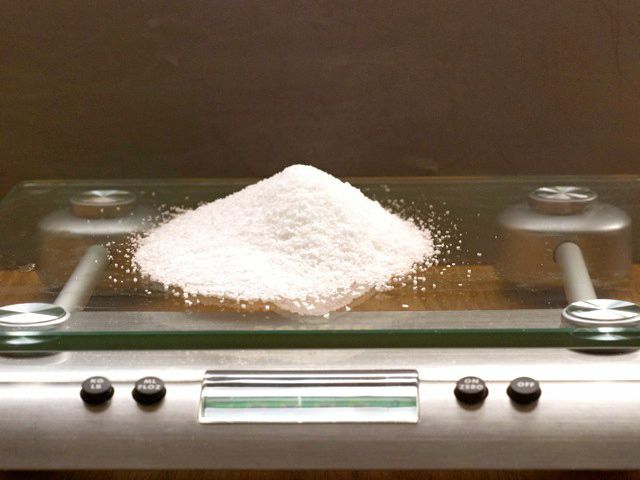 A gram of table salt is the same as a gram of any brand of kosher salt, regardless of the volume. An accurate [%amazonProductLink "digital kitchen scale" asin=B0007GAWSC] costs around $25 and makes precision in baking so much easier. One great baking book that includes weight measurements is [%amazonProductLink "Artisan Baking" asin=1579652913] — unfortunately, it's breads only. 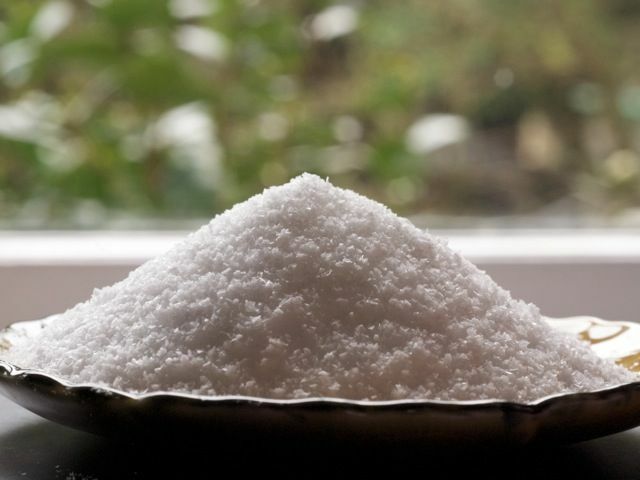 Table salt is made up of small cubic crystals that pack together tightly, while kosher salt particles are larger and coarser and take up more space. Consequently, a teaspoon of table salt will contain more salt than a teaspoon of kosher salt. How much more depends on the brand. Morton kosher salt takes up 25 percent more space than table salt, so you'll need to add an extra 1/4 teaspoon per teaspoon of salt in the recipe. Diamond Crystal takes up twice as much volume as table salt, so you'll need to use double the amount given in recipes. As for sea salt, let's include it in the category of finishing salts, since there's significant overlap between them. There are countless varieties of finishing salts, but the major groups, from a cooking perspective, seem to be flaky sea salts, coarse sea salts, mined aromatic salts, and aroma-added salts (e.g., smoked, mixed with clay). I've collected a few of these as gifts or impulse buys over the years. They are all significantly more expensive than table or kosher salts; the celebrated French sea salt Fleur de Sel de Guérande,_ for example, retails for $25 to $50 per pound, compared with around $1 per pound for Diamond Crystal kosher. Whether these fancy salts are worth the money depends on how you use them. As the name implies, “finishing” is definitely the right way to think of these salts, because a little goes a long way when they're added to the surface of food before serving. In addition to a burst of salt taste, they can add desirable texture, pleasing color contrast, and occasionally extra aroma. I like to add a sprinkle of “crunchy salt” (I have a 250-gram container of Halen Mon flaky sea salt from Wales that's lasted years) to savory dishes. Aromatic (smoky, sulfurous) salts can also be fun, but aren't as broadly useful, so I wouldn't spend a ton of money stocking up on them. Because diluting these expensive salts in recipes doesn't make much sense, use the cheap stuff for cooking and save the fancy salt for showtime. So, if you're looking for one salt to buy, kosher is the best all-around performer. You can use it in all of your recipes and put a cellar on the table for individual seasoning. And in a pinch — groan! — it'll even do double duty as a finishing salt. p(bio). Based in Portland, Oregon, Hank Sawtelle has engineering, legal, and culinary degrees. Email questions for the Ask Hank column to AskHank@culinate.com.